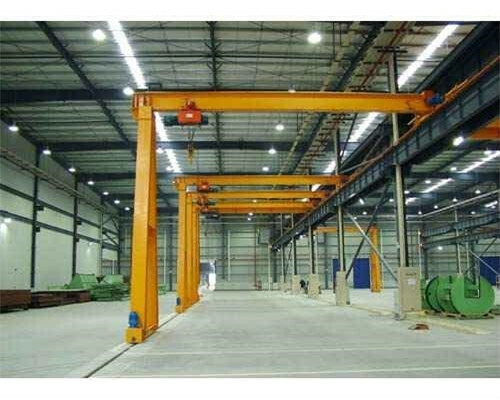 Between the overhead bridge crane and gantry crane, there is the single leg gantry crane, which is also called semi gantry crane. There is only one leg to support the entire gantry crane in a single leg gantry crane. Just like the other gantry crane, the semi gantry crane is also made up with four main parts. They are the hoisting mechanism, big and small vehicle walking machine, and the steel structure. The semi gantry crane is widely used in warehouse, workshop, stock yard and ship yard to lift the goods under 16 ton. There are many types of semi gantry crane produced by us. According to the girder structure, they can divide into single girder gantry crane and double girder gantry crane. Aimed at the different working environment, they are also several types. For instance, the BMH box structure semi gantry crane, the BMG type indoor use semi gantry crane and the BMG type outdoor use semi gantry crane. Besides these modes, we are capable and confident to custom your particular semi gantry crane with advanced technology and competitive price to meet all your requirements. Lightweight design. Our motorized gantry crane is the result of over one century’s hard working and consistent innovation. Compared with the traditional technology, the electric gantry crane is lower with a decrease of around 25% and less with almost 30%, as well as owns lighter wheel pressure and quite small critical distance. Modular design. There are much advantages can be get though a modular design. Such as the richer product assortment, easier installation and transportation, as well as the stable product quality and shorter supply cycle. High security. Equipped with so many safety devices, our electric gantry crane holds the most safety. These advanced safety protection includes the monitor system of overload limiter, the self-examine system, limit switch, and imported wire rope from Germany. Ellsen Company is a mature and qualified overhead crane manufacturer with more than 700 clients and 6 factories. During a half-century development, Ellsen Company has accumulated rich experience and professional engineers. We always adhere to the principle of “customer first, technology ahead”. No matter what material handling solution you need, Ellsen can meet them with advanced technology and responsible attitude. Every component and crane machine is produced on the basis of international standard. We are strictly treated the quality of every overhead crane, and the fully test will be provided before purchase. Relying on these, we won a lot of customers both home and abroad. Ellsen Company will be the best and right choice for you.